I’m using RowingCoach on a nearly daily basis for tracking my rowing workouts. […] My only issue is that it doesn’t start automatically! I’m forever forgetting to start it before launching off. Operator error, hah! And that is not the only comment I got where someone reports forgetting to start a workout. So how to prevent this from happening? Fortunately the new iOS 12 offers added Siri functionality. RowingCoach now uses Siris machine learning capabilities to learn when and where you usually row. Siri will then intelligently suggest to start a workout when you approach your rowing club. The Siri watchface intelligently suggests a workout based on your previous workouts. Quickly start a workout on your iPhone with a Siri suggestion. 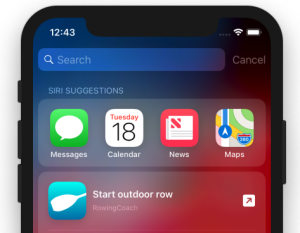 RowingCoach also supports the new shortcut functionality of iOS 12. So if you want to include starting a RowingCoach workout into any of your routines, you are good to go! Heart rate alarm: You can now see when your pulse is higher than your configured threshold and you should relax a little bit. Pulse is now also shown during a workout pause. You can now configure a countdown that will be shown before the workout starts. This entry was posted in News on 20. September 2018 by Gunther. Finally the beta testing of RowingCoach has started! And everybody is welcome to test. Just contact me if you want to give the app a try-out. Hopefully it won’t be any time longer untill the final version is released. This entry was posted in News on 9. February 2017 by Gunther. I really do. When I started rowing a few years back, I immediately fell in love with this beautiful sport. In what ever mood I was, my time on the water was always great: When I was just relaxing from a long workday and when I was exhausting myself surrounded by the beauty of nature amidst the cranes watching my boat gliding through the water. With all the positive sides, there was always one thing that bothered me intensely. With any other sport it is easy to track your workout. When jogging, we are accustomed to see how we did compared to last week. Did we beat the sluggishness that accompanies the cold and foggy winter months? And what distance did we cover during this one great workout a few months ago? But there was no convenient modern way to that. Until now! This is where RowingCoach comes into play. 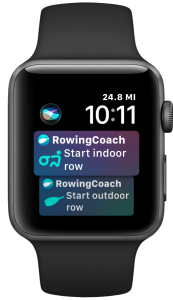 It is a convenient easy-to-use app for your iPhone and your Apple Watch which accompany you with your rowing workout. It gives you all the metrics you might ask for. It tracks the essentials like the distance you covered, your pulse and calories burned as well as the duration of your workout. But most importantly it detects your strokes automatically using the incredible fine sensors in your device. With this intelligent stroke detection you get an instant display of your stroke rate, also called SPM (strokes per minute). It also displays the time needed for 500 meters. Thanks to the strokes detection it can separate the true workout duration from idle phases when you pause and enjoy the scenery. So you don’t have to always pause and continue the workout manually. Of course while being on the water your hands are occupied, so it was inevitable to integrate Siri and let her start and stop a training upon your voice command. Look here for an overview of the features. But sometimes we have to row indoor, so the app for the Apple Watch also includes an indoor mode which records your SPM and other vitals to get you through the winter. There is a lot of development going on and I appreciate any comments or feature request. Just drop me a line and let me know what you think! Have a nice row and enjoy the app! This entry was posted in Allgemein, News on 8. February 2017 by Gunther.